Volleys are key strokes that frequently are not practiced as often and as well as they should be.� Being able to volley is key for doubles play, but can be an important component in singles, as well.� The modern game of tennis promotes big groundstrokes and huge serves.� But, what can a player do when she/he finds herself/himself losing in a match?� Well, of course, she/he should enact plan �B.�� For many players, serving and volleying and/or chipping and charging can be the best alternative strategy when the groundstroke game goes awry.� In either case, the player will find herself/himself at the net�where volleys and overhead smashes are the essential strokes. 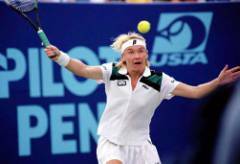 Now, I know for some of you coming to the net only occurs when you are shaking your opponent�s hand at the end of a match.� Why?� Let�s be honest.� There are lots of players who just don�t possess volleys with which they feel confident. 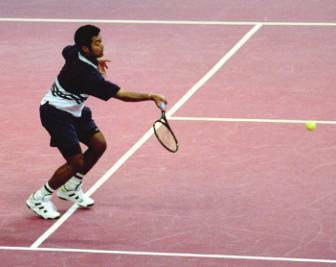 Well, this month�s column will address the forehand volley in a manner that will hopefully inspire the needed confidence. The eastern forehand grip is a more �natural� and stronger grip for the forehand volley.� It puts the wrist, arm and elbow in positions that allow for strong, controlled volleys.� These reasons are why many tennis teachers encourage beginners to use this grip for forehand volleys.� The disadvantage to this grip is that it is not appropriate for the backhand volley.� Thus, the player must make a grip change when hitting the backhand volley.� With rapid exchanges that can and do occur at the net, any grip change may be a liability. 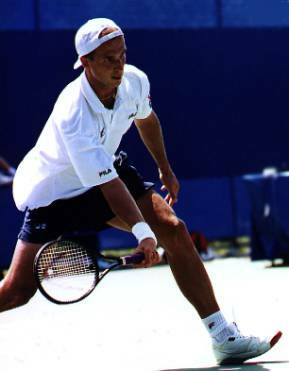 Players who use the hammer grip generally do not make any changes when moving from forehand to backhand volleys.� It has been my experience that players who use this grip generally have good volleys but are a little weaker when hitting the low volley. 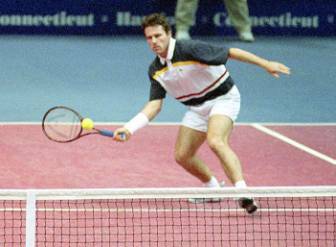 Some years back, I had the opportunity to get a piece of advice from Stefan Edberg regarding volleying.� Truly, he was one of the very best volleyers to ever play the game. 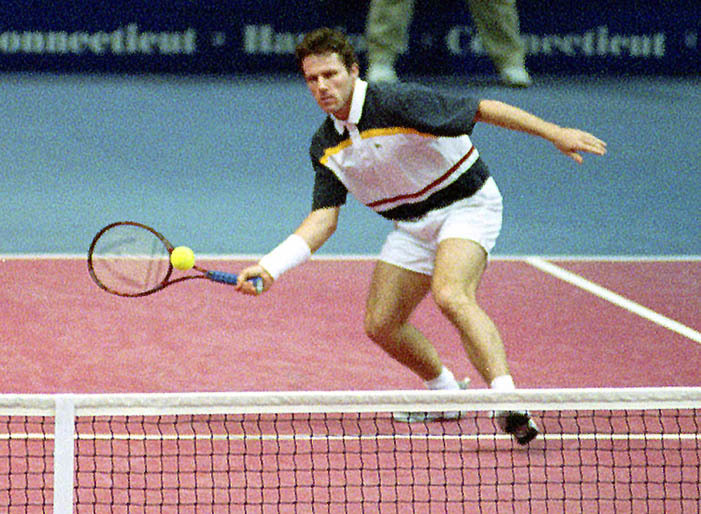 When asked what is the most important thing about volleying, he answered, �seeing the ball come off the opponent�s racquet was key.�� He further explained that volleying is something that requires as much anticipation as is possible.� To better anticipate the opponent�s shot, Edberg suggested that one really needs to concentrate on the ball as it makes contact with the opponent�s racquet strings.� This action will give the volleyer a better �read� on where the opponent�s shot is headed, and thus, will help the volleyer anticipate how to move properly to hit the volley.� I have found this advice to be extremely well founded. 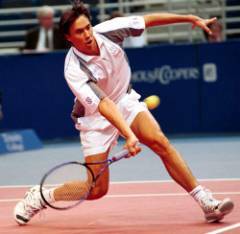 Moving to the ball is a critical ingredient in proper volleying.� The closer your body is to the ball when you volley, the more control you will have over it.� To facilitate this movement, I suggest that you move your head toward the ball as it comes toward you. Often times, you hear coaches say to their players�get down low to hit the volley.� Well, this is good advice for those balls that fall below the height of the net cord.� The goal, however, is to try and hit the volley when the ball is at maximum height.� Unfortunately, this is not always possible.� However, if you constantly are moving forward as you move to volley, you will have the best chance at hitting a high volley, which is much easier to hit than the low volley. Here we see Jana Novotna hitting the high forehand volley.� She seemed to always get close enough to the net to hit the highest possible volley. 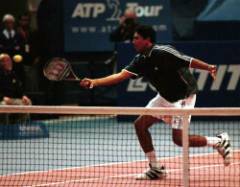 Whenever possible, hit the forehand volley in front of your body.� Now, this will require you to bend the wrist back if you are using the continental or hammer grips.� Too often, I see players (including myself) hitting the volley with the racquet parallel to the shoulders or even behind the shoulders.� Sometimes, this can�t be helped.� But, hitting the forehand volley in front will greatly improve the control and pace of your volleys. 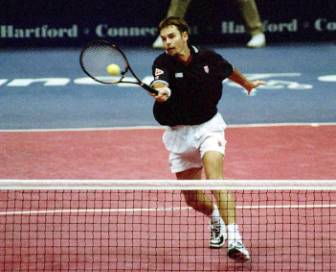 Here is a shot of Todd Woodbridge hitting a volley well in front of his body.� What is amazing is how often he is able to hit the forehand volley in front. Notice how his wrist is bent fully back. 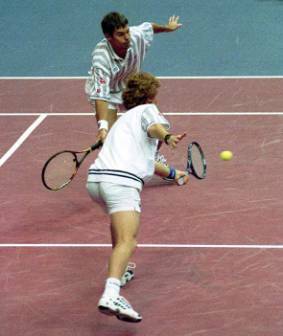 In addition to hitting the forehand volley as far in front of your body as is possible, it is critical that you try to keep your racquet hand�s elbow close to the body.� Groundstrokes on the forehand side usually necessitate that the elbow be up and away from the body.� Quite opposite is true for the forehand volley. 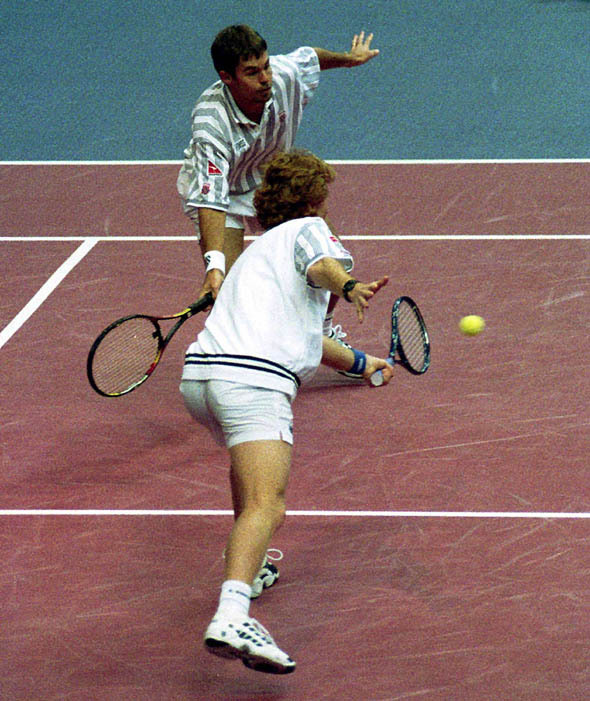 In the following three pictures, notice how each player has his elbow in close to the body and the racquet hand wrist bent back.� Remarkably, each of these players was able to hit the forehand volley well in front of his body. 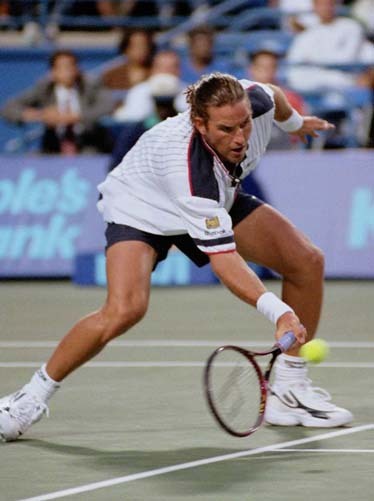 Good technique associated with any volley (forehand or backhand) requires that the racquet head be above your wrist at the moment of contact.� If a player can keep his/her racquet head high even on the low volleys, he/she is much more likely to volley deep and with control.� Too often, the groundstroke-oriented player allows her/his racquet head to get below the wrist when volleying.� This is not surprising because when hitting topspin, the forehand and backhand groundstrokes benefit from the lower racquet head. Here are some shots of low forehand volleys where the racquet head is either parallel with the wrist or slightly above the wrist.� Obviously, to keep the racquet head up when hitting the forehand volley, the player must be willing to bend his/her knees.� For we older players, this is not always a pleasant task, but one that is necessary. Finally, a player needs to practice her/his forehand volley frequently.� How you practice is critical.� When having balls hit to you, don�t stand too close to the net.� In reality, we rarely get truly close to the net when hitting volleys in a match.� I suggest that you stand a little bit in from the service line when practicing volleys.� This is much closer to reality. In addition, don�t just practice volleys.� Practice serving and volleying, and chipping and charging the net.� Have your hitting partner hit a ball low to your forehand side as you approach the net after serving.� He/she can do this by not returning the serve but by hitting a ball, which he/she is holding in his/her hand.� Also, hit an approach shot off of your opponent�s serve (a chip).� Instead of having him/her hit your approach, have him/her use another ball (held in his/her hand) to feed you a low shot to your forehand. These �play action� practice drills are critical if you truly want to incorporate volleying into your game because they replicate match play. Use an eastern forehand, continental or hammer grip. Concentrate keenly on the ball as it comes off your opponent�s racquet. Try to move your head to the ball as you approach the ball to volley. �This will keep your body in proper position to hit the volley. 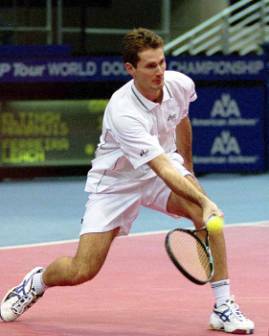 Try to hit volleys before the ball falls below net height.� This means that you have to move forward to volley. Try to hit forehand volleys in front of your body. Keep the wrist bent fully back and the racquet hand elbow close to the body when hitting the forehand volley. Try to keep the racquet head above your wrist when hitting volleys. Practice your volleys often.� When practicing �static� volleys keep closer to the service line�not near the net.� Also, try to replicate match play by incorporating �play action� drills into your practice sessions. If you follow these 8 tips, I am sure that in no time your will find your forehand volley has become a weapon�not a liability�and you will soon become a tennis overdog.